Faith is back to school, but it is hot lunch Wednesday and she does want Chik Fil A, so only Ben needs a lunch. I meant to boil him an egg, but it completely slipped my mind last night and by the time I remembered, there wasn't time before my bedtime. 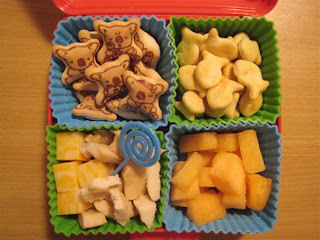 Instead, Ben has cheese and diced chicken breast (that was stolen from Monday night's stir fry), parmesan Goldfish crackers, strawberry koala cookies and diced canteloupe. I'm not sure how much will be eaten, they have a little Fall Festival at his school and they are going to cook pumpkin something in his class. Hi there I love your blog and read it often looking for lunch ideas for my girls. I just thought I would let you know in case you haven't heard that a certain type of Koala cookie has been recalled for melamine in the cookies. I am not sure if they are the same ones you have but just wanted you to have an FYI. Here's a link. Hope this helps you.